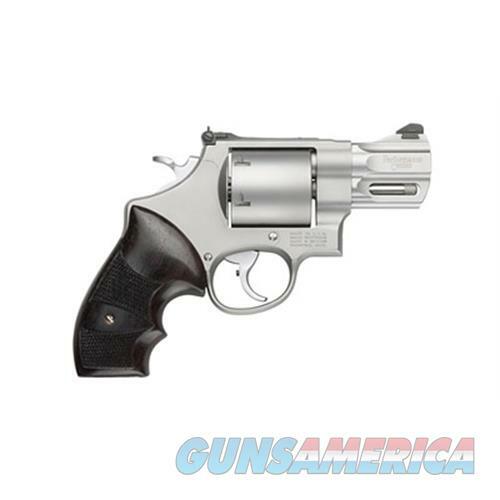 Description: Action: SA/DA - Caliber: .44 Magnum / .44 S&W Special - Capacity: 6 - Finish: Stainless - Material: Steel - Grips: Wood - Sights: Dovetail Red Ramp / Adjustable White Outline - Barrel Length: 2.625 - Overall Length: 7.625 - Weight: 37.6 oz - Chrome Flashed Custom Tear Drop Hammer - Chrome Flashed Trigger with Stop - Dovetailed Red Ramp Front Sight - Adjustable White Outlined Rear Sight - PC Action with Ball Detent Lock-Up - 8-Shot Cylinder Cut for Full Moonclips - Performance Center guns originate from standard designs or are created from the ground up. From hand-cutting and fitting to fine tuning for precision these firearms are top performers. Products from the Performance Center are the ultimate expression of old-world craftsmanship blended with modern technology.